The rubber chicken is a classic gag that still gets laughs every time. The uses for a rubber chicken are endless: pull it out at a random moment, use it for decoration, or offer it up for dinner one night. Our directors love this prop to pull from under the mattress in “Once Upon a Mattress”. 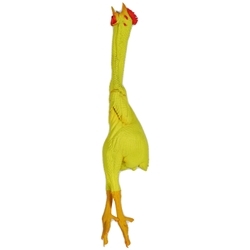 The classic rubber chicken is colored as pictured and measures 18” in length.